I am still coughing, my chest still sounds like a badly played hand-organ, my head still aches, my vision goes blurry with the coughing and so on...BUT I finished the fingerless mitt #1. Nice job on your first fingerless mitt! And with a thumb, no less - my first couple of fingerless mitts didn't have a proper thumb gusset. I did think about just binding off the opening, but having looked at two videos, decided "I can do that...maybe..." and dove in to try. Now I know what I don't know, and now directions make more sense when I hear/see them. It went on Richard's hand, but the thumb opening was tight on him. It's not on me; it's comfortable without being loose-bulky. Comfortable to wear is important. That looks to be a beautiful fit. Two questions: (1) Have you ever knitted gloves? That is, with fingers? 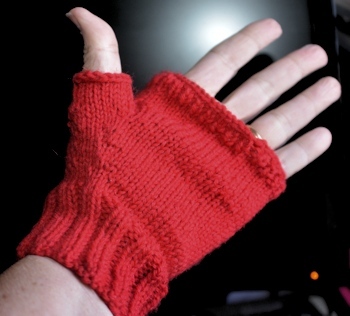 (2) being fond of wearing fingerless gloves, myself, have you attempted knitting fingerless gloves? This is my first attempt at knitting a fingerless mitt (or glove.) There are previous posts with more explanation and pictures. The second one is started but a) I got the Editor's Letter for the next book and started working on that and b) it heated up here and I don't need it. What did you think this thing was if NOT a fingerless glove? I'd expect the more mittenlike fingerless gloves to sometimes scrunch back and expose too much of the hand, which is not a problem with the short, open fingers. They look more complicated to knit than completely fingerless gloves, but probably less complicated than full-fingered gloves, since the fingers are shorter and finished without closing. 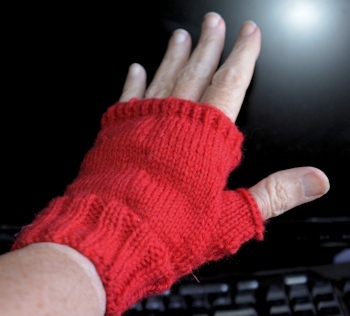 I've seen "fingerless mitt" (not mitten--though it's an obvious possibility) and "fingerless glove" used interchangeably in knitters' discussions, though that could be the writers' errors. For the temperatures we get down here, I think the fingerless mitt, which will be simpler to make than a glove with partial fingers, will suit me fine. Outside I need leather gloves, for the things I do outside. Inside, typing, I need less coverage than partial-finger coverage. Most gloves (and especially fingers) are knit with small needles than I can easily use.